Description: Excitement was high when we found out that this weir was to be completely rebuilt during 2003/2004 and was to include features to create kayak friendly white water. However in all the water levels we have looked at it, the white water forms between the weir stanchions in the form of a terminal hydraulic, and when the water finally does release itself from this death grip it washes straight into the strainer of the walkway bridge supports. 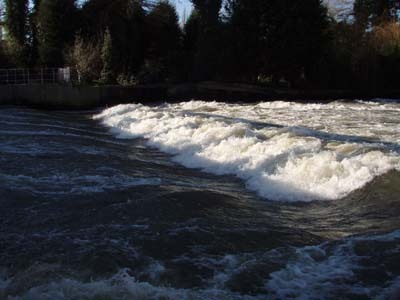 In 2006 we found out that when the River Thames was starting to flood and the weir was on 7 gates or fully open it creates a gorgeous wave like hole. It’s unlike any feature I know but once wired most moves are possible especially learning how to felix. Hazards: So to the down side. There is a bridge just down stream. You must have a solid first time roll and plan what you will be doing in the event of capsize before going onto the wave. Making it back over to the eddy is not too hard but I do express caution. All the way down on river right by the bridge are a series of fast deep boils. There are lots of hazards in and slightly above the water (Bridge Stanchions, cut off old supports, protector posts for the weir). So be careful and keep an eye on the people you are paddling with. Behind the bridge from the lock down is a series of pylons which look hazard free apart from they have an under water fence running in-between them with the full current of the river pushing against it. So be careful. Marsh is a dangerous place to paddle; it’s an accident waiting to happen if your paddling ability is not up to it. You can’t afford to make any mistakes so please only paddle here if you are very experienced and of course never alone and at your own risk. Directions: From the centre of Henley drive out on the Reading road, after about 1/2 a mile you will see a “Jet” petrol station (if you get to the Tesco roundabout, you have gone about 500 meters to far). Just before the garage is a left turn called Mill Lane. Take that left and follow the road until you have gone over the railway bridge and come to a football club on the left. Park in that car park. Walk down the road towards the river and then go over the river on the wooden bridge until you reach the lock. Cross the lock, to put in on the far bank.